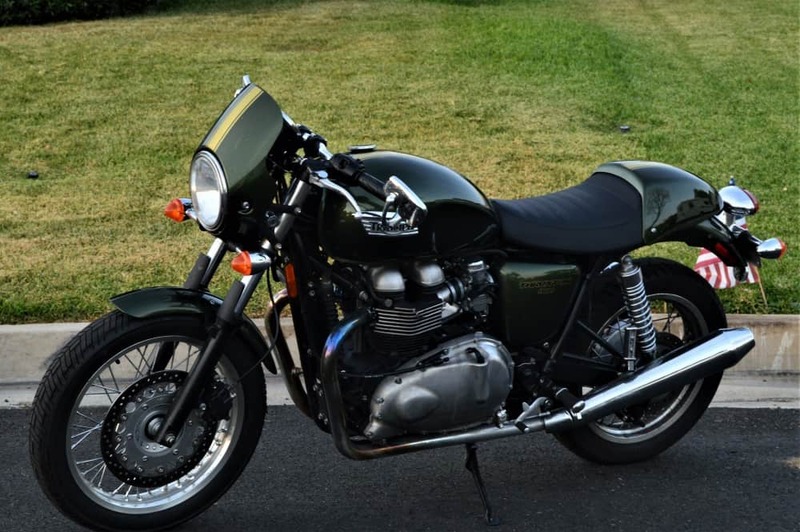 Here we are with a British Racing Green Triumph Thruxton 900 Motorcycle for sale, this is a super fun machine with only 6500 Miles on the clock and makes for a super deal for some one out there. $5,500. The bike is all stock and is a fun machine that starts right on the button, you can ride as is or customize it to your own tastes etc, it rides like a Cadillac and the gear shifting is such a smooth transition, so easy to ride and many girls are using these bikes as they are not heavy compared to the Japanese machines and sit lower too. 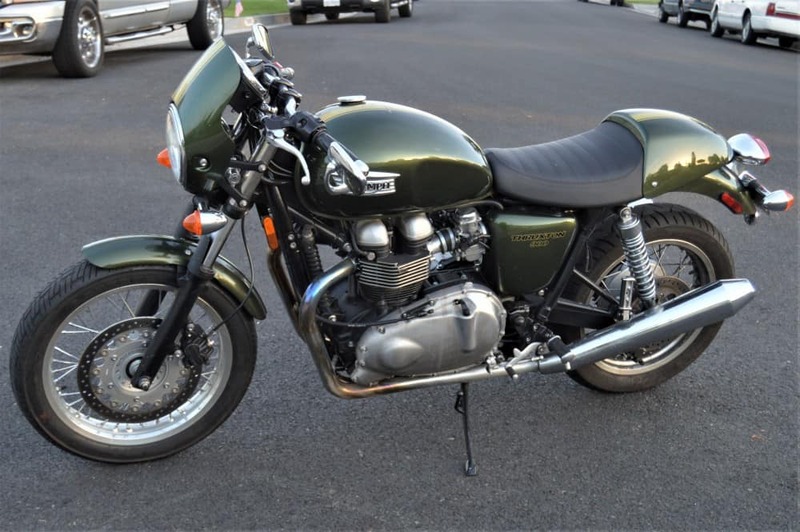 I purchased it from a Customer that was moving and thought I would offer it on here as many people ask me about the bikes for sale. So-.when a manufacturer reproduces a classic look while blessing it with contemporary technology? 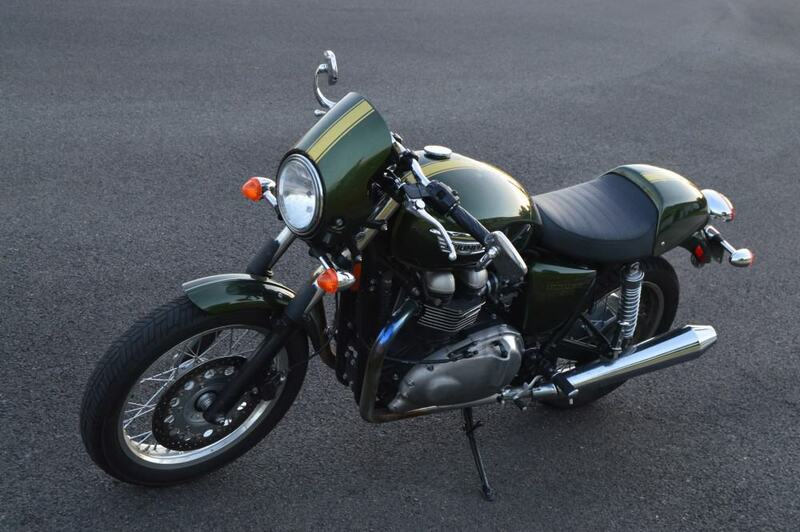 Well, I do, so you can imagine my delight when I laid eyes on the Thruxton 900 from Triumph. 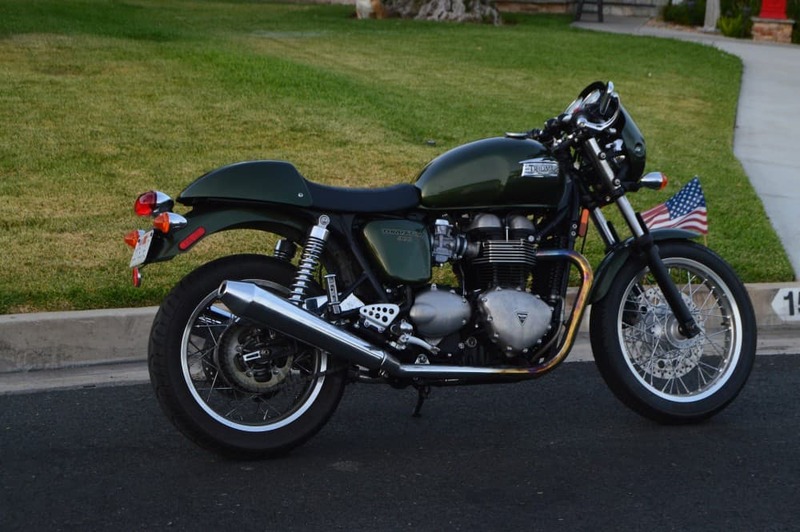 From the bullet front fairing, across the knee-dent fuel tank to the tail fairing, this bike embodies the 1960’s cafe’ racer vibe, and Triumph furthers this historical connection by naming this model after the famed Thruxton Race Track. Best of all, the retro good looks are backed up by subtle improvements, such as the fuel injectors hidden in the ’carburetors’ and disc brakes instead of the old drums, among others that I will touch on later. Overall, the factory designed this bike to serve as a daily commuter/weekend burner with a liberal dose of nostalgia added. 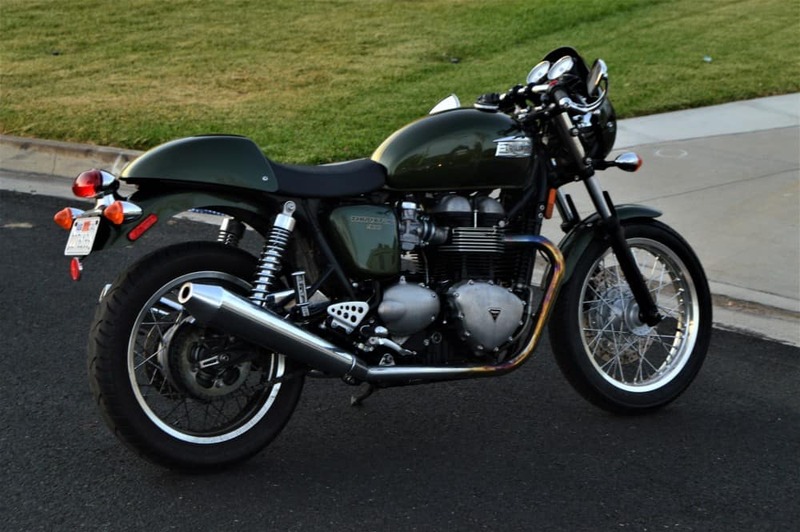 Triumph kept many of the design aspects from the original, Bonneville-based cafe’ racers of the 1960s, at least in spirit. A small bullet fairing protects the headlamp nacelle and the handlebar-mounted gauges, but little else as it is not quite as large as what the ’old boys’ ran back in the day. 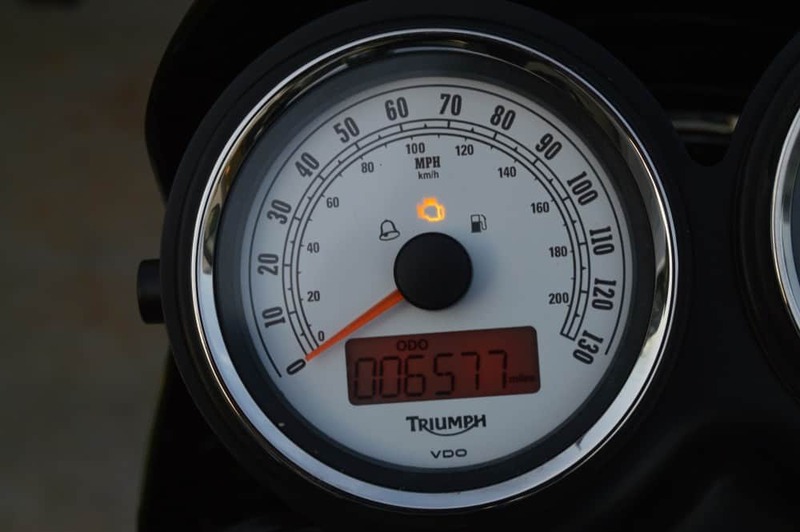 The fuel tank is the classic design that actually has the knee dents in it, yet it still manages to hold 4.2 gallons of fuel, which puts the capacity just below that of purpose-built tour bikes. I love that they used this tank, because I always feel a bit cheated when I see a ’Trumpet’ out and about, and upon closer inspection discover that the “dents” are actually a painted-on effect. 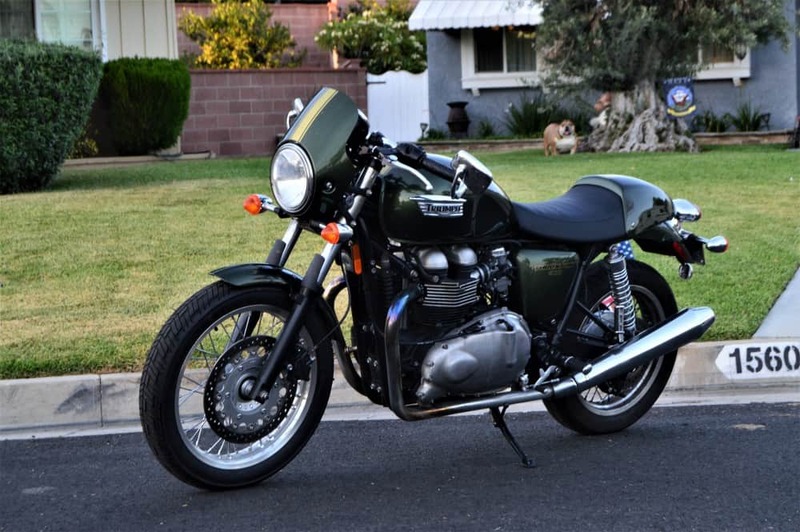 Rear-fairing design is also true to history with the classic, tapered rear over-the-fender design. Personally, I have always preferred the fenderless style, but I have to concede that this design has a more practical function during road use. 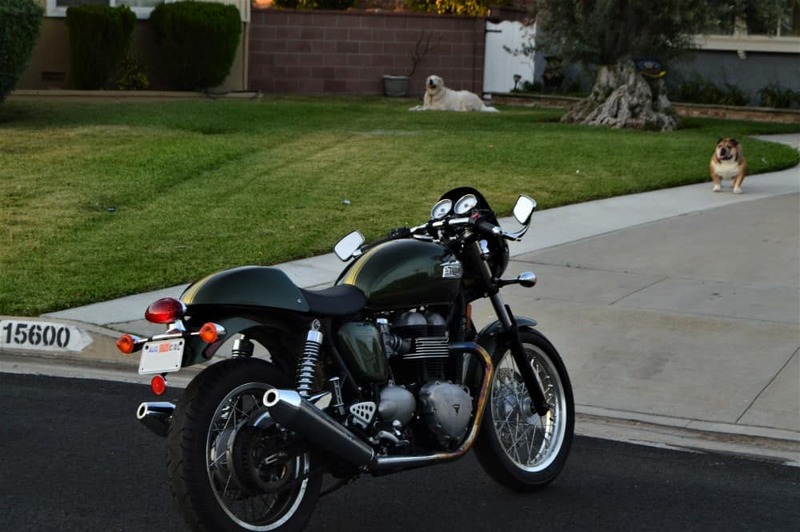 I have personally owned Three Triumph Thruxton’s and they sure are a blast to ride. 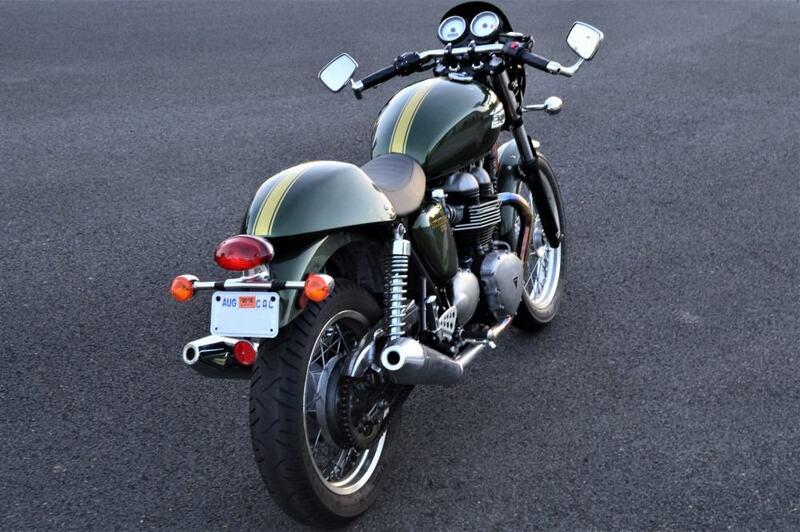 Wheel design provided Triumph with another opportunity to blend aesthetics and function. The factory started with aluminum rims to keep the unsprung weight low, and then graced them with chromed wire spokes. I always have liked laced wheels (except when they are on the truing stand! 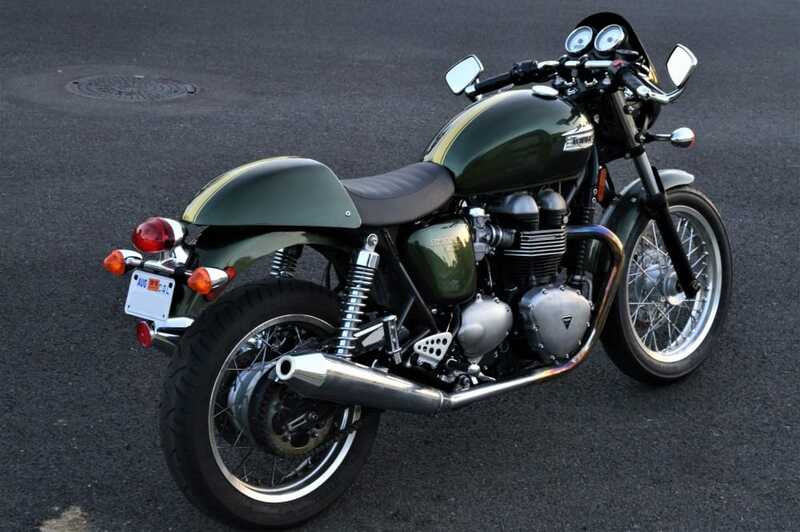 ), and these certainly add another touch of class to an already classy bike. Dual-piston Nissin calipers work with the single 320 mm front and 255 mm rear brake discs, and while I can appreciate Triumph wanting to keep the wheels as clean as possible, I think that I would prefer to have dual front brakes. Having said that, with a curb weight of only 507 pounds this brake configuration should be sufficient to provide ample control of the bike. The factory used 41 mm KYB front forks with chrome KYB adjustable shocks in the rear, with over four inches of travel at both ends to soak up the bumps and shocks of the road before your kidneys do. 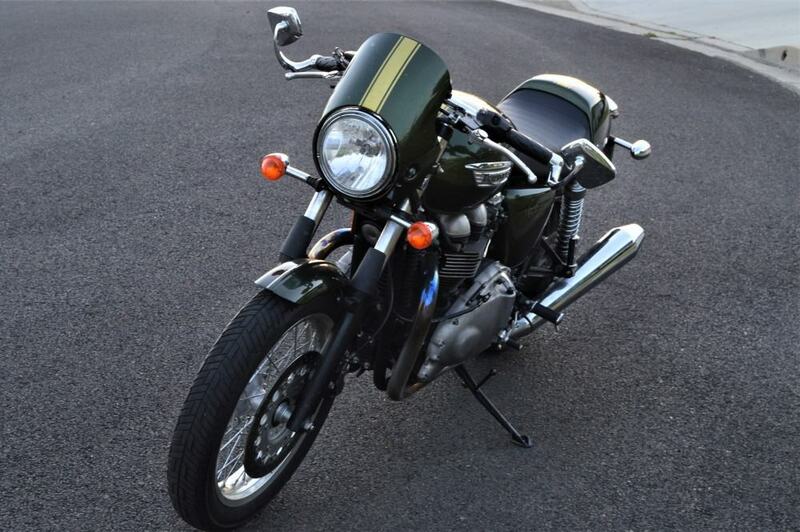 With an overall length of 84.6 inches and a 58.6-inch wheelbase, this bike is kept within the rather compact outer dimensions established by earlier cafe’ racers. 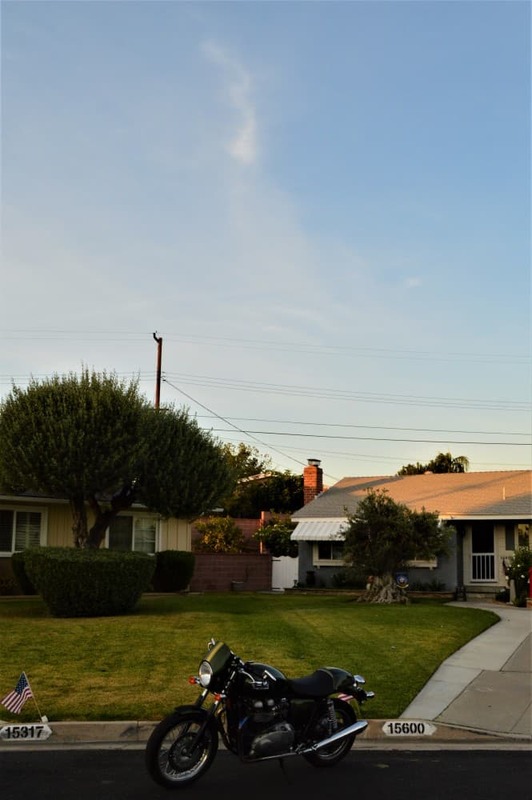 Above, this bike shows the actual low mileage, the bike fires right up, runs smooth and is all stock factory parts on this 900, easy to ride and maneuver. The Bikini Front fairing keeps the bugs and buffeting away from you and also gives it that Yesteryear look of the Classic Cafe racers of the day running from The Busy Bee Cafe to the Ace. 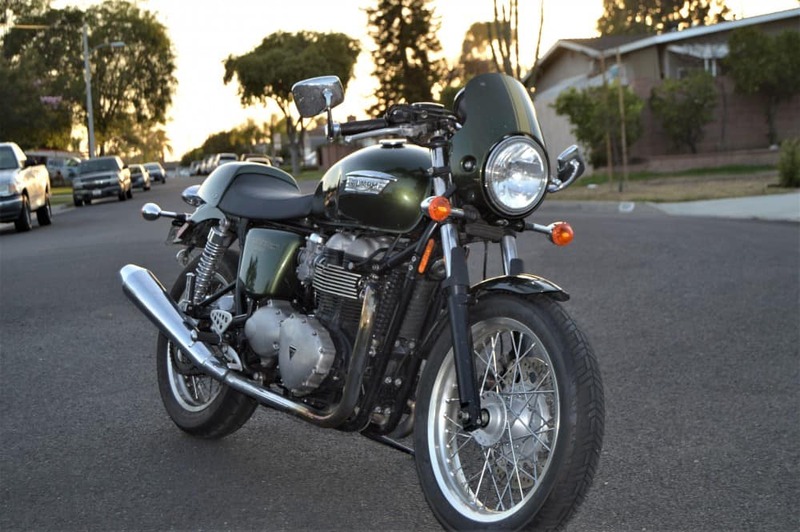 A Great bike for the money, pay and ride off into the sunset. 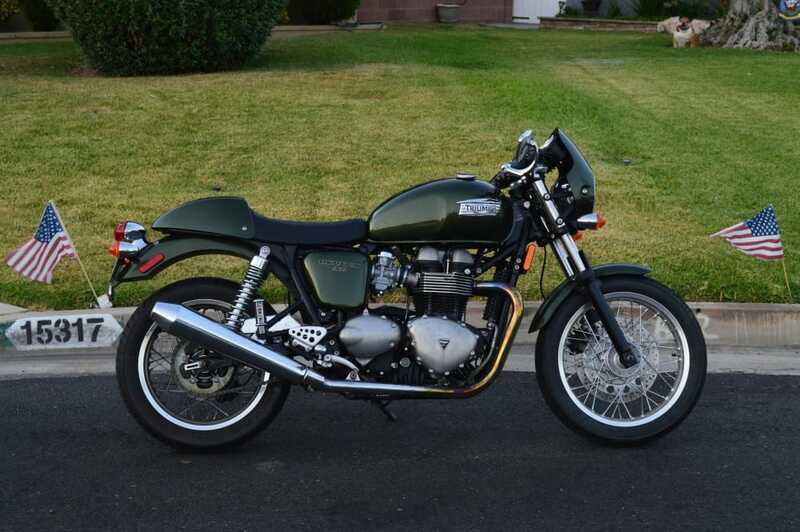 714-598-8392 call or text me if you are interested in this 2014 Triumph Thruxton. Have Title in hand.